The Four Winns H190 bowrider is a great entry point into the Four Winns family of runabouts. 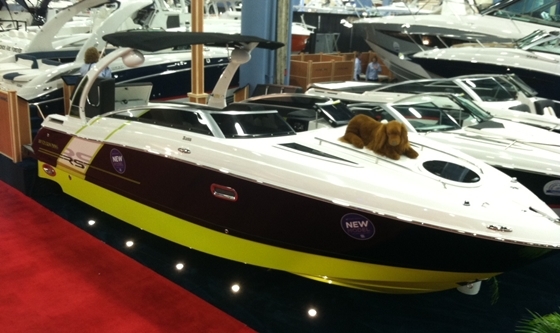 A boat like the Horizon 190 bowrider is a great starter runabout for a new boater. It’s priced at under $30,000, but it is built with impressive quality and attention to detail. That’s important for retaining customers. What’s also important is having a model line that will entice those same customers to stay with your product, and that’s where Four Winns has an advantage. The Four Winns H190: a perfect beginner bowrider. 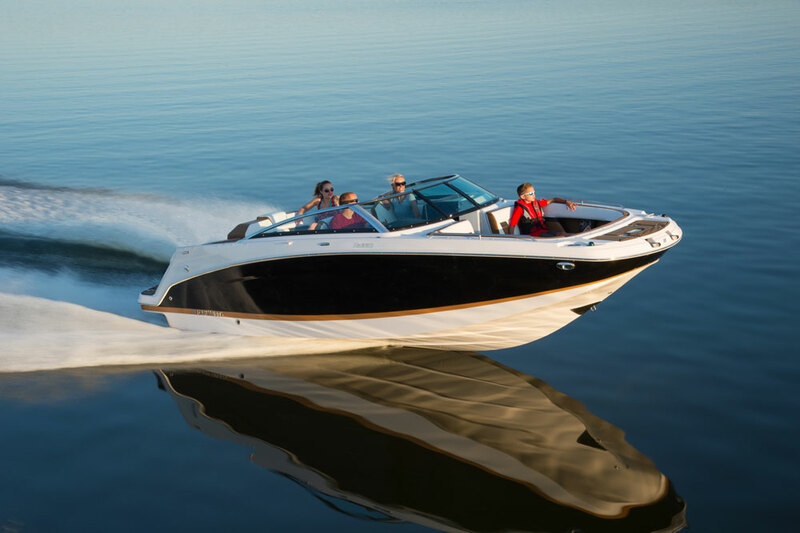 Buyers who want to move up in size and amenities can choose from Four Winns’ cuddy boats (like the Sundowner 265), and watersports boats (such as the H230 RS). If what they really want is a vacation home on the water, those same buyers can look into larger Four Winns cruisers, like the H440. But we’re probably getting ahead of ourselves here, so let’s just stick with that starter boat, the H190. Let’s begin with the most innovative part of the boat, which is at the stern. Even if you don’t tick the box for the optional extended swim platform, the aft section is brilliant. The platform itself is treated with Sea Dek foam rubber matting, which provides for sure footing when dry or wet. It also feels luxurious on bare feet. And things get even more interesting on the sunpad. Both sides of the sunpad flip up and forward to create aft-facing lounge chairs, so you can keep an eye on your kids as they swim behind the boat. Or drop the backrests down to create a full-width sunpad over the engine compartment. 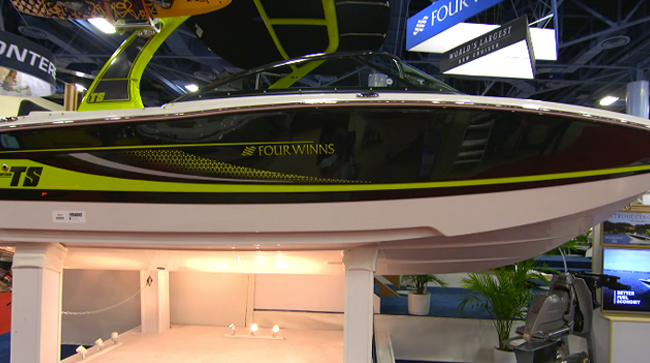 On the Horizon 190, transom and swim platform design are major highlights. The seats do take away a little stowage space, but Four Winns included some very clever stowage compartments flanking the engine, which are accessible through the rear bench seat backrests. That engine will be a MerCruiser 220-horsepower V6 engine with a catalyzed exhaust, if you choose the standard powerplant. It should be plenty to push around the 2,830-pound H190. There’s also an optional 4.5-liter V6, a proprietary engine developed in-house by Mercury Marine, and some V8 engines available with up to 270 horsepower—though that might push this boat out of the price range of entry-level buyers. Inside, the cockpit is simple and straightforward so far as entry-level runabouts go. 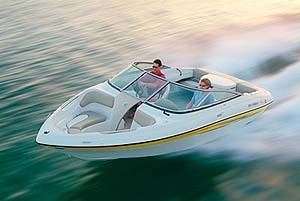 The rear bench has stowage underneath and the front buckets swivel on pedestal mounts, and each comes with a flip-up thigh bolster, which is almost required equipment on modern runabouts. At the helm, note a no-glare dash and efficient layout. The helm is fitted with four gauges and a remote control for the stereo, which is housed in the port-side glove box. Mercifully, Four Winns has done away with the faux woodgrain plastic dash panels in favor of gray plastic. Combined with the padded dash “eyebrow” up top and the tilt steering and sport wheel, it all works well. Up in the bow, the H190 features forward-facing lounges with sensibly angled backrests and grab handles that fall naturally to hand. Virtually all runabouts have stowage underneath this seating area, but what’s nice about the Horizon 190 is that all these compartments are finished in positive-molded gelcoated fiberglass. What that means in the real world is that there’s nothing inside to absorb water and then foster the growth of any sixth-grade biology experiments. That begins to matter more as years of ownership accumulate, and boaters start looking for their next boat. When that happens with Horizon 190, of course, Four Winns has any number of models in which buyers might find themselves at home. Other Choices: An even less expensive bowrider in this size range is the Tahoe Q7i. 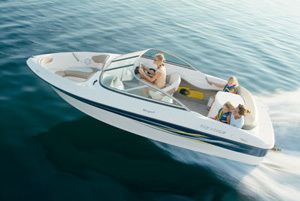 A bit more up-scale (and a bit more costly) is the Cruisers Sport Series 208. Read about a wider range of bowriders in 10 Top Notch Bowriders: Read this Before You Buy. See Four Winns H190 listings.